How to Cite This Chapter: Ainsworth C, Tomkowski W, Kuca P. Cardiac Tamponade. McMaster Textbook of Internal Medicine. Kraków: Medycyna Praktyczna. https://empendium.com/mcmtextbook/chapter/B31.II.2.18 Accessed April 19, 2019. Adler Y, Charron P, Imazio M, et al; European Society of Cardiology (ESC). 2015 ESC Guidelines for the diagnosis and management of pericardial diseases: The Task Force for the Diagnosis and Management of Pericardial Diseases of the European Society of Cardiology (ESC). Endorsed by: The European Association for Cardio-Thoracic Surgery (EACTS). Eur Heart J. 2015 Nov 7;36(42):2921-64. doi: 10.1093/eurheartj/ehv318. Epub 2015 Aug 29. PubMed PMID: 26320112. Sagristà-Sauleda J, Angel J, Sambola A, Permanyer-Miralda G. Hemodynamic effects of volume expansion in patients with cardiac tamponade. Circulation. 2008 Mar 25;117(12):1545-9. doi: 10.1161/CIRCULATIONAHA.107.737841. Epub 2008 Mar 10. PubMed PMID: 18332261. Roy CL, Minor MA, Brookhart MA, Choudhry NK. Does this patient with a pericardial effusion have cardiac tamponade? JAMA. 2007 Apr 25;297(16):1810-8. Review. PubMed PMID: 17456823. Little WC, Freeman GL. Pericardial disease. Circulation. 2006 Mar 28;113(12):1622-32. Review. Erratum in: Circulation. 2007 Apr 17;115(15):e406. Dosage error in article text. PubMed PMID: 16567581. Cardiac tamponade represents the most severe and urgent clinical presentation of pericardial effusion. It occurs when pericardial fluid accumulation exceeds the elastic limit of the pericardium, resulting in significantly elevated intrapericardial pressures. Cardiac tamponade is a life-threatening condition resulting from a slow or more rapid compression of cardiac chambers due to the accumulation of pericardial inflammatory/malignant exudates, pus, blood, clots, or gas. 1) Pericarditis (eg, idiopathic; viral; other infectious, including tuberculous pericarditis in developing countries where tuberculosis is endemic). 2) Iatrogenic (eg, invasive procedure–related, as in the case of complications related to percutaneous coronary intervention, atrial fibrillation ablation, pacemaker lead insertion; postpericardiotomy syndrome after cardiac surgery). 3) Neoplasm/malignancy (eg, metastatic breast or lung cancer, lymphoma, melanoma). 5) Systemic autoimmune disease (eg, systemic lupus erythematosus, rheumatoid arthritis, scleroderma). 1. Symptoms: Dyspnea; reduced exercise tolerance; sometimes cough, dysphagia, syncope or presyncope. 2. Signs: Most common signs include tachycardia (in patients with hypothyroidism or uremia it may be absent), pulsus paradoxus with a systolic arterial pressure drop >10 mm Hg with inspiration, an enlarged cardiac silhouette on chest radiography (before pericardiocentesis: Figure 1; after pericardiocentesis: Figure 2), and jugular venous distention. Other signs include diminished or muffled heart sounds, hypotension, and tachypnea. 3. Natural history: Slowly accumulating effusions cause gradual distension of the pericardium, which allows the accumulation of large pericardial effusions (often ≥1 L). In the case of rapidly accumulating effusions or reduced pericardial elasticity, the intrapericardial pressures increase promptly and lead to cardiac tamponade with as little as a few hundred mL of fluid. Cardiac tamponade can lead to obstructive shock and cardiac arrest. 1. 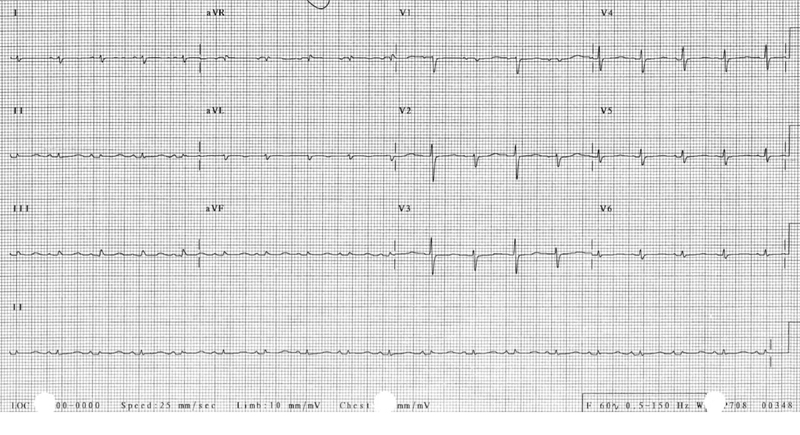 Electrocardiography (ECG) may occasionally be normal but usually reveals sinus tachycardia. Other potential findings include low QRS voltage (<5 mm in limb leads and <10 mm in precordial leads) and/or electrical alternans of the QRS complex (Figure 3). The end-stages of tamponade are associated with bradycardia, and death is due to pulseless electrical activity (PEA). 2. Chest radiography: Enlargement of the cardiac silhouette without features of pulmonary congestion. In patients with acute cardiac tamponade, the cardiac silhouette may be normal. 1) Late diastolic and early systolic right atrial collapse. 2) Early diastolic right ventricular free wall collapse (this may be absent in patients with a marked right ventricular hypertrophy or elevated right ventricular diastolic pressures). 3) A “swinging heart” within pericardial fluid. 4) Dilation of the inferior vena cava (with loss of the inspiratory collapse). 5) Doppler echocardiography shows exaggerated respiratory variability in mitral and tricuspid inflow velocity. 4. Computed tomography (CT) reveals pericardial effusion. In patients with chylopericardium it may help to locate a connection between the thoracic duct and the pericardium (especially when combined with lymphography). 5. Analysis of the pericardial fluid is used in the case of equivocal etiology. Cardiac tamponade is diagnosed on the basis of clinical features and imaging studies, mainly echocardiography. Clinical signs of cardiac tamponade should be differentiated from acute right ventricular myocardial infarction and other causes of right ventricular dysfunction. 1. Intravenous fluid bolus may be attempted to temporize (this is not a substitute for definitive treatment); however, only approximately 50% of patients will have a favorable stroke volume/hemodynamic response to fluid loading. 2. Pericardiocentesis is a life-saving procedure in those with clinical/echocardiographic pericardial tamponade (note that large pericardial effusions do not always cause tamponade, and therefore a clinical and hemodynamic assessment is required). Needle pericardiocentesis +/- pericardial tube insertion using echocardiographic guidance is the preferred method of pericardial fluid drainage if technically feasible. 3. 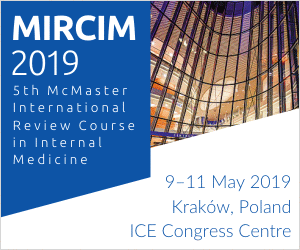 Surgical approaches can be considered if effusion is not amenable to percutaneous needle drainage as well as in case of purulent effusions, recurrent effusions from malignancy requiring pericardial window creation, or hemopericardium with clotted blood. 4. Treatment in chylopericardium depends on the etiology and volume of the lymph in the pericardium. In patients in whom chylopericardium is a postoperative complication, use pericardiocentesis and a diet containing medium-chain triglycerides. If the lymph continues to accumulate, use surgical treatment. Figure 1. 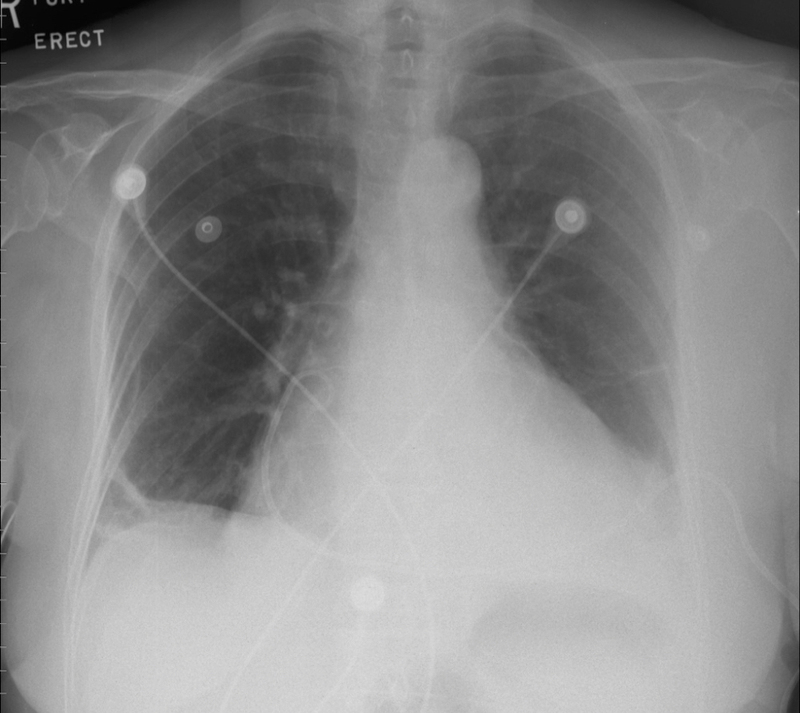 Chest radiograph of a patient with cardiac tamponade before pericardiocentesis. Figure courtesy of Dr Craig Ainsworth, McMaster University, Hamilton, Canada. Figure 2. 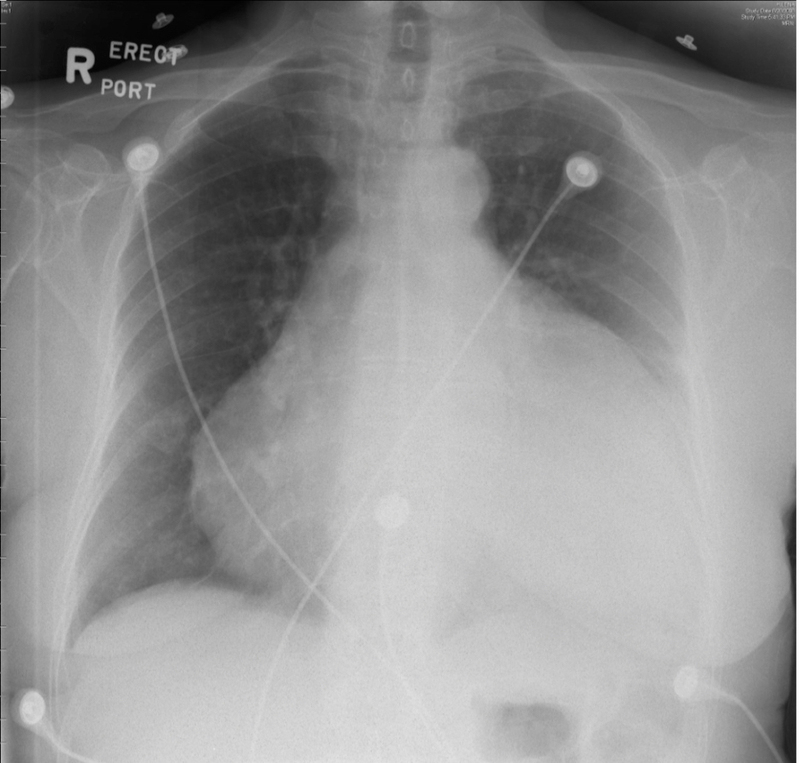 Chest radiograph of a patient with cardiac tamponade after pericardiocentesis. Figure courtesy of Dr Craig Ainsworth, McMaster University, Hamilton, Canada. Figure 3. Electrical alternans of the QRS complex in a patient with cardiac tamponade. Figure courtesy of Dr Craig Ainsworth, McMaster University, Hamilton, Canada. Figure 4. 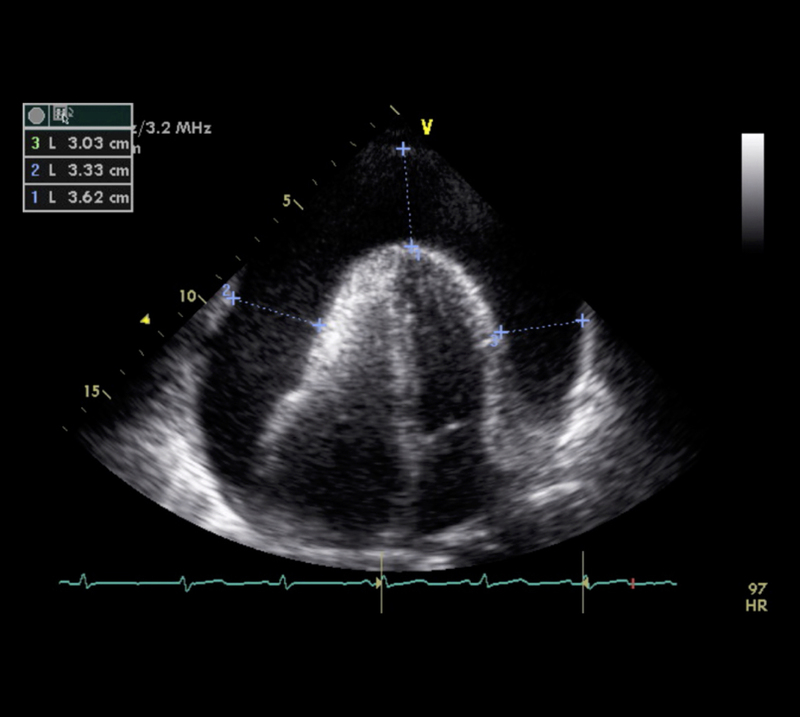 Transthoracic echocardiogram showing the apical 4-chamber view and a large pericardial effusion. Figure courtesy of Dr Craig Ainsworth, McMaster University, Hamilton, Canada.